Sometimes the content outweighs the delivery, and such is the case with Hyde Park on Hudson. Especially considering The King’s Speech and our new-found knowledge of the stuttering King George, we were poised for a dramatic retelling of the events leading up to Britain’s and America’s entrance into WWII. Doubly interesting is the story of FDR, the wheelchair-bound President who had so much impact on our history. A story about these two great men coming together to help decide the fate of the world is automatically fascinating and will draw audiences no matter what. Too bad this film doesn’t hold up to its story, giving us just enough to enjoy, but not enough for us to remember long after. Franklin Roosevelt was, surprisingly or not, a great philanderer. His marriage to Eleanor was more a companionship, she being rumored to prefer women, even living with lesbian couples in a separate house from FDR. He, in fact, lived with his mother when not in the White House, in Hyde Park, New York. There, the president would preside over national affairs, as well as his own affairs, which, as our story begins, include his own distant cousin Daisy. She would become a major part of his life, even attending the festivities surrounding the visit of the King & Queen of England prior to WWII. England needed America’s help but was much too proud to beg. What followed was a historic weekend filled with political and social intrigue. Though not a great film by any estimation, Hyde Park on Hudson at least has a few more positives than negatives, which is something, though also disappointing for a movie about such an important time period. The biggest flaws were Laura Linney’s acting, which was fairly awful, and Roger Michell’s direction, which was equally bad. But they were overcome by some pretty excellent pieces of the puzzle. 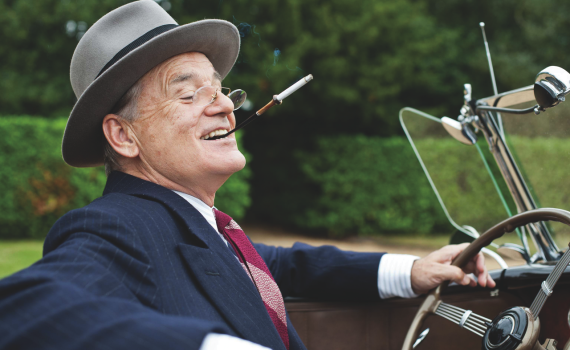 Bill Murray was very convincing as FDR, the King & Queen of England were perfectly portrayed, the music of the film was wonderful, the color stunning, and I enjoyed two odds aspects of the story; that the wife of main character need not be an Earth-shattering presence and that love triangles don’t necessarily always shatter. This film was enjoyable, if just, barely overcoming a slow pace and some bad apples, ultimately becoming a mediocre movie that only history buffs might love.